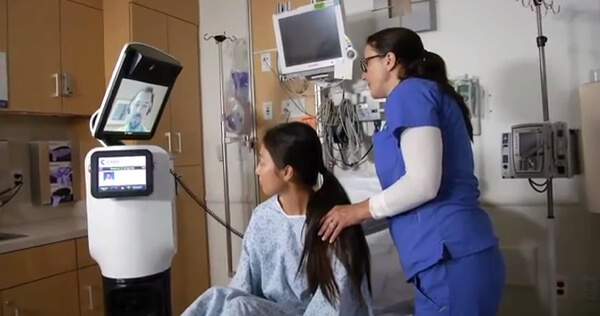 Telepresence Robots Invade Hospitals - "Doctors Can Be Anywhere, Anytime"
A disembodied human face hangs atop a robot chassis next to a Redmond, Oregon hospital bed (not pictured). The doctor on the screen is 20 miles distant, in Bend. But from there he is able to assess the patient and determine whether she should be moved to a better equipped hospital in Bend or further afield. The doctor’s name is Dr. Kevin Sherer, the volunteer patient Anita Boucher, and together they recently performed a test run using an InTouch Health RP-7i telepresence robot nicknamed Roda (robotic office diagnostic assistant). Dr. Sherer can pilot Roda down the hall with a joystick, turn its camera to check vitals, and interact with the patient by way of the screen atop Roda’s chassis. In addition to telepresence capabilities—and with the help of a nurse placing a special stethoscope—he can remotely check the patient’s heart beat over headphones. Although they haven’t had a chance to make full use of Roda’s capability, Daniel Davis of St. Charles Redmond told Singularity Hub most medical equipment with USB connectivity can be transmitted to doctors. And according to Davis, those early tests using volunteer mock patients went well, winning over even the skeptics. Since then, the robot has been put to good use, including at least one midnight visit. Currently, Roda is the hospital’s lone telepresence robot, and Davis says there are no concrete plans for another. However, down the road—no doubt depending on how well Roda performs—he believes they may purchase more machines. And it’s not hard to see why. As the sheer volume of medical knowledge increases and becomes more specialized, telepresence robots like Roda bring specialist expertise wherever it is needed, regardless of location. InTouch, partnering with iRobot, recently took another step toward that goal with their latest model (RP-Vita). Instead of requiring doctors pilot the robot from room to room, they need only select the destination room on a touchscreen map. The RP-Vita navigates the halls, using onboard sensors to avoid obstacles, arriving at its destination without the doctor’s input. So why aren’t these robots in every hospital? Simply put, they are very costly. The RP-7i price tag is a hefty $95,000. That’s a serious investment. Particularly considering much of the the system’s capability can seemingly be duplicated by an iPad ($499-$829) and a Double Robotics iPad robot ($1,999). Undoubtedly, the equipment on the RP-7i is higher quality and specialized to the task at hand. But those points alone don’t make up for a price over 30 times more expensive than the simplest workable solution. As it turns out, at least part of the cost may be traced to regulatory compliance. Hospitals can’t use just any video conference tool—they have to use an FDA approved one. InTouch’s telepresence robots are considered Class II devices, requiring strict FDA manufacturing oversight. The FDA requires the system be highly secure to protect patient confidentiality—and to avoid hackers posing as doctors and approving medical procedures! It’s understandable. Patient safety and confidentiality are paramount. But one wonders whether the benefits of lowering the regulatory bar a bit might outweigh the feared costs. The more easily knowledge and skill flows through the system, the higher the level of average patient care. But greater value and easier regulation should come with time—as regulators and hospitals alike become more familiar with the risks and benefits of the technology. Ultimately, telespresence should join quite handily with other information technology inspired advances. Perhaps we’ll have a multi-use medical robot with Roda’s body and telepresence capabilities, Watson’s brain, and the X Prize’s tricorder. Why not?